As Office 365 grows in popularity, IT administrators find themselves with new time-consuming tasks: creating, provisioning, and managing Office 365 users and groups. These tasks are often in addition to managing their on-premises Active Directory. DSRAZOR for Windows streamlines Office 365 user management by allowing you to create, delete, and manage multiple Office 365 user accounts and groups in addition to Active Directory account creation and management. DSRAZOR also gives you the ability to report on existing Active Directory and Office 365 users and groups, along with Office 365 license statuses, maximizing the efficiency of your IT resources. 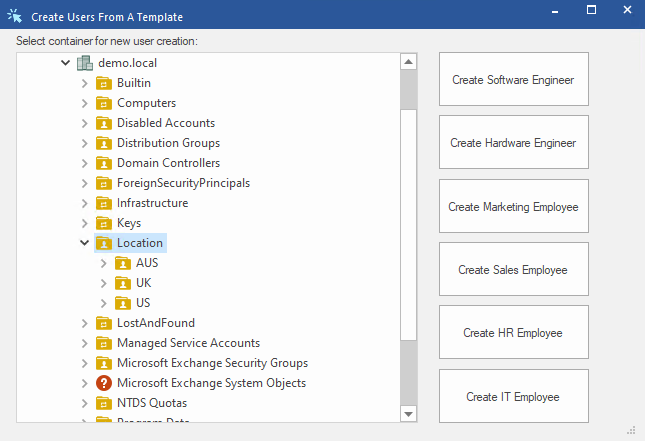 Bulk user creation within Active Directory and Office 365 is a breeze with DSRAZOR. DSRAZOR can automatically perform actions such as create home directories and set group memberships for new users. DSRAZOR lets you quickly perform bulk Office 365 user account deletions, view and restore deleted accounts, set and reset passwords, add and remove cloud licenses, and delete cloud-only Office 365 groups. Document and export reports of current Office 365 user account status and user account attributes, Office 365 license status, and all Office 365 cloud-only groups.